More than one month has passed since the disaster began, and AMDA is now in the second month of its relief activities. After one month of conducting these activities, AMDA staff have seen some positive changes among the evacuees. For example, some have been able to find somewhere to live, either in new houses or with their families, and they now feel more at ease about the future. However, there are those who are still uncertain about the future, which is exacerbating stress levels. 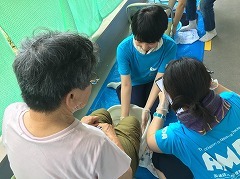 Taking these factors into consideration, AMDA continues to conduct its activities at three evacuation centers - Sunwork Soja (Soja City), Sono Community Center (Kurashiki City, Mabicho) and Okada Elementary School (Kurashiki City, Mabicho), along with Okada Community Center (Kurashiki City, Mabicho), where a first aid station has been set up. Throughout its Emergency Relief activities so far, AMDA has been supported by numerous volunteers. 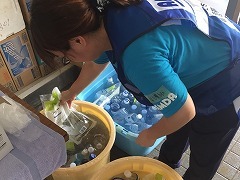 What’s more, Kuroshio Town in Kochi Prefecture, a member of AMDA’s Platform for the Great Nankai Trough Disaster*, has dispatched public health nurses, Asahigawaso, an affiliated medical institution, has dispatched a nurse, and Okayama Prefectural University and Tamano General Medicine Vocational School have also dispatched volunteers. *AMDA’s Platform for the Great Nankai Trough Disaster is a disaster-response network of municipal governments, medical institutions and private businesses, etc. to prepare for the expected Nankai Trough Disaster which is said to be expected to hit Japan in the forseeable future. As of 6th August, there were 35 evacuees living at the Sunwork Soja evacuation center. On this day, AMDA dispatched one public health nurse and one coordinator to take care of the evacuees in cooperation with local health workers. The team goes on set rounds throughout the day, talking to each evacuee personally to get a grasp of each individual’s health conditions. In the morning, between 10:00 and 12:00, the AMDA Disaster Acupuncture team gave acupuncture treatment to seven people. Six of whom were repeat patients praised the effectiveness of the treatment and asked for the service to continue. The team was very happy that the patients ended the treatments with smiles on their faces and saying that they were able to relax. One evacuee in his twenties who was suffering from back pain from cleaning his house received acupuncture treatment for the first time. He said, “I thought that acupuncture was only for the elderly. I received the treatment upon the staff’s recommendation, but I never thought it would ease my pain so much. Thank you very much”. On the 6th, 19 volunteers from Soja City helped the victims in the Mabicho Okada area to tidy up their houses. 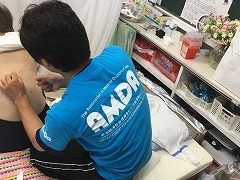 Among these activities, AMDA dispatched one nurse and one coordinator to the first aid station at the Mabi Community Center Okada Branch to provide medical support with the volunteers. Whilst cleaning up their houses, there’s also the issue of working in such heat. So, AMDA handed out sports drinks to the volunteers to prevent anyone from getting heatstroke. On the 6th, the team provided acupuncture treatment to 18 people. It seems that now, rather than shoulder or back pain, there have been more people suffering from general malaise due to issues such as lack of sleep, constipation, etc. There are also those who have said that their conditions have steadily worsened as the evacuation continues. However, many patients who have received acupuncture treatment multiple times have said that, the more they receive the treatment, the more they are open to conversation and feel relaxed. Conversing with patients is vital, even in acupuncture treatment, as it can sometimes help to identify underlying issues and lead to better understanding the patient’s health condition. It is also essential in working with other health workers to provide thorough and effective health support. For example, the AMDA team will report any cases of fever or coughing to other health workers at the site, and conversely, other health workers sometimes refer patients who are suffering from muscle pain to the AMDA Disaster Acupuncture team. In addition to acupuncture, seven people received massages and 18 people had their feet washed at the AMDA care room. There are many evacuees who regularly go to get their feet washed and enjoy talking with the AMDA staff, which also acts as a good remedy for stress. Even after they have had their feet washed, there are some who stay to continue their conversations. In this way, the AMDA care room also acts as a place where the evacuees can come and relax by talking to each other and/or the AMDA staff. 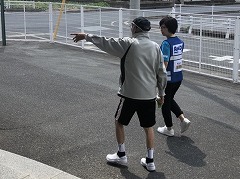 AMDA dispatched one AMDA nurse and two volunteers from Okayama Prefectural University to cooperate with local staff to help the elderly evacuees at the community center. In addition to generally looking after them, the AMDA team helped clean with the evacuees, helped them during meal time, with laundry, got them to participate in group exercises, assisted them going to the toilet and took them out for strolls. On 3rd August, while the team of acupuncturists had been busy providing the acupuncture treatment, a lawyer visited the shelter to offer a mobile legal consultation service. In total, 15 people sought professional advice amidst a month-long shelter life. The service was well received by the evacuees as they were relieved to hear the words of the expert in the most challenging time. It is fair to say that the activity could be included in AMDA’s health-related assistance as it helped lessens the victims’ stress and gave them a sense of security. On the 4th, in response to the increasing risk of heatstroke among volunteers who are working in the sweltering weather, AMDA donated 10 boxes of sports drinks to Soja Social Welfare Committee that handles the coordination of incoming volunteers from both inside and outside the region. It was the third time for AMDA to donate such goods to the organization following the similar donation on the 20th and 31st of July. As the extreme heat is expected to continue for a while, the precaution is a must for anyone that takes part in the disaster recovery. 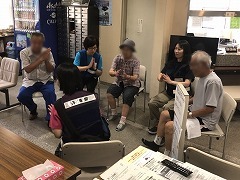 On the 5th, a Mongolian doctor who was visiting Okayama for a training purpose from Mongolian National University of Medical Sciences paid a visit to evacuation shelters in Soja City. While studying the life of the evacuees and AMDA’s activities, there were moments where he helped the volunteers or had a talk with the victims in person. Some of the evacuees seemed rather surprised as no one expected a visitor from such a distant place. After that, the doctor took part in a meeting at Soja City Government Emergency Headquarters. Expressing his deepest sympathies to the victims, he stressed the importance of psychological care for the children and the elderly.